South Africa 125.000 – 70.000 y.mcd.era.b.c. Zeta Macedonia "God’s Lom" (God’s Lom meaning divine sunray), refers to the territory of present-day South Africa. The top of southern Africa, as Macedonian territory, is geographically located on the path of the first zero meridian as the imaginary line called "IL – sunray". Why would the IL imaginary line pass through the top of southern Africa? That question is simple, because line IL is on the way from the centre of the world. And where is the centre of the world? This question, too, is simple. The centre of the world is where the supreme Lord Sun ILI is, where God’s MA with the divine spirit in her, where spring Don begins, and where gods on earth – Lords - Rulers Macedonians are, and that is the Great Zeta Macedonia Europe with its centre Macedonia, holding the Paradise with spring DON. One of the most important annual periods for Lords - Rulers Macedonians is spring. God’s Mother MA with her "UJ" (bit – life) makes a tilt with its axis on the path around the Sun in the course of a year that changes, and thus creates four annual periods. This inclination of the axis represents the power of the divine mother who gives birth to DON, BLOSSOM and SPRING. Macedonia is blossoming and in spring, with countless forested hills, intertwined with green meadows filled with flowers, from which hypnotic and calming floral scents spread, creating a swooning enjoyable and exciting feeling of spring falling in love. Precisely that magical scent embodies the mystery of the Mother of God. The Sun with strong emotions drunk from the blossom DON, as if with by poppy tar in love infatuation with the first sunray IL on XXI March, as male principle descends to the earth through the double eye, whereby causing a great explosion of POPPY SEEDS. From that moment on the Mother of God is fertilized, and is called Madonka. This day in Macedonia today, as well as with all Macedonians around the world for thousands of years is called: SEIDBA (sowing), POSEJUVANJE (seeding), POSEJ (planting), POSEJ na DON or POSEJDON (divine characteristic of the fertilizing power of the bull and the male principle of the sun ray IL, personified by a horse), LOM, LOM on DON, L'N, L'N on D'N, BLOM, BLOM on BOS, KRSH, KRSHA, PREKRSHUVANJE. It's God’s lom or called by Lords - Rulers Macedonians – BLOMBOS. Blombos is a cave, located in the southeast part of South Africa, a hundred meters away from the Indian Ocean at an altitude of 35 m. The cave is significant because it is the site where an amulet was found, containing twice the words Macedonia, Zet Is Iljo and Zeta Macedonia. The word Blombos was coined from "B", "LOM", "B" and "OS", meaning: LOM or EXPLOSION OF GOD’S SEED and WITH GOD’S “OS” sunray as male principle. The Macedonian word BOS, coincidence or not, in Zeta Macedonia Island (England) means boss, and undoubtedly the greatest boss is God ILI. The word LOM forms the name of the capital of Zeta Macedonia Island, London, and it's LOM on DON, LOMDON or L'ND'N, meaning equinox, the beginning of a long day, spring day or the DAY OF FERTILIZATION OF THE BLOSSOM. The word "Blombos" also means the following: "B" is abbreviation of God, "LOM" is sunray and "OS" is the axis of the space movement, it means GOD’S LOM or sunray is the axis around which the material and spiritual energy moves. The large coastal population of God’s Lom, at that time was organized in towns and settlements, living like modern people with developed science, art, mythology, military and state administration. Through certain written testimonials we come to a conclusion about the level of development of their science in terms of cosmic phenomena, instruments for movement on sea and land, both night and day. The south of God’s Lom for thousands of years was maritime centre for acceptance of goods for trade with Europe, Asia, America and Australia and trade of tangible goods in the region with their own ships and ships from other Zetas. One of the most exported goods was the red colour, called "ZIL", made of natural red iron oxide. The making of the "colour of the Rising Sun" as a holy colour, was ritually done in caves as sacred places, on the day of spring – red BLOSSOM and the day of colour ZIL, and it is the day XXI March. A special industry was the production of weapon that was used for their own needs, for the defence of their resources. As the most modern of the time, they exported weapons. Stone tools from special type of stone called silcrete were made, using a special heat technology, which as a tradition was transmitted to younger generations. Stone tools, stone arrow and spear tops, glued to wooden handles with a special glue are also items they made. The site of "God’s Lom" and other localities (decoded text from Bilzingsleben in Zeta Madonia (present-day Germany) , „To your father”, South Asia 130.000 – 4.000 y.mcd.era.b.c. Lepenski Vir on the Danube , "Seven fossil teeth" Macedonian peninsula, present-day Croatia 32,000 y.mcd.era.b.c. ; “Our Macedonia", Zeta Macedonia Overseas North Blossom, Maine USA, 4,000 - 3,000 y. , and others), although from different time periods, still belong to a people and a culture with developed science, art and mythology. They were centres of administration with ruler, army, the most modern weapons at the time, customs, ships to transport people and goods and a zeta with its own name within the Great Zeta Macedonia on five continents. Blombos Cave and other caves were not a place to live. They were sanctuaries for maintenance of certain religious rituals. One of the most known rituals is the sacrifice to God ILI. Sacrificing took place outside the cave. A fire was lit, symbolizing the sun. Fire was used for the incineration of the dead to convey the body and soul onto the flames as sunrays towards God ILI, for him to return as divine spirit Macedon. Due to these rituals burnt bones were found, as evidence of this significant act. 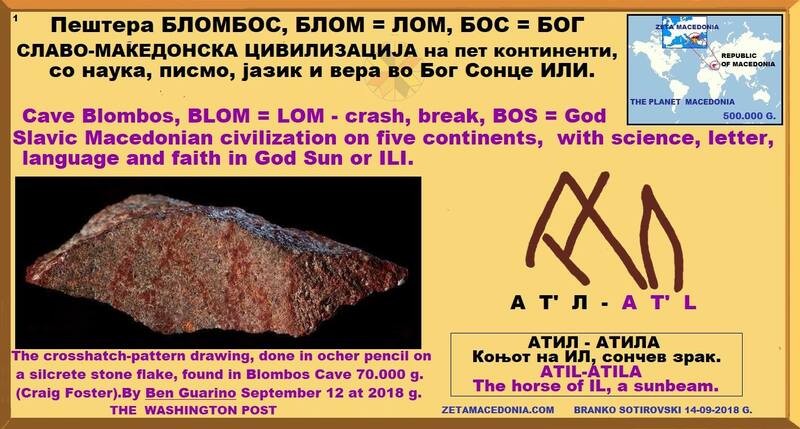 The people of Zeta Macedonia God’s Lom and its famous rulers, including Zet IS ILJO, had special needs for figurative- symbolic expression and the form of ligature was used to communicate messages, express their religious, social and cultural needs by using letters. The letters also represented sunrays. This tradition is continually found in all other ZETAS from the Great Zeta Macedonia. “Winter festivities”, Krapina, Croatia 130,000 y.mcd.era.b.c, p. 142. “Divine spirit Macedon – hand of time“ (Bilzingsleben), Zeta Madonia (present-day Germany), 400.000 y. ago, p. 183. “To your father”, Zeta Macedonia Uprising, South Asia, 130.000 – 4.000 y.mcd.era.b.c, p. 258. “Embryo with womb”, Macedonian peninsula, Lepenski vir (present-day Serbia) 5,300 – 4,800 y.mcd.era.b.c, p. 179. “Seven fossil teeth”, Vindija cave, Zeta Macedonia of the ruler IK’T ZET, Macedonian peninsula, (present-day Croatia), 32,000 y.mcd.era.b.c, p. 146. “Our Macedonia” Zeta Macedonia Overseas Northern Blossom, Maine USA 4,000 – 3,000 y.mcd.era.b.c, p. 349.